Academic leaders are increasingly expected to be strategic and innovative in their work, whether that be increasing student success, improving teaching and learning, growing enrollments, advancing research efforts, serving the community, and more. Meeting these expectations requires leaders to work with a broad range of students, faculty, staff, and various external constituencies. At the same time, they must navigate fast paced environments, demanding schedules, increasing accountability expectations, declining or stagnated resources, and frustrating bureaucratic hurdles. These challenges can often lead to a range of emotions for academic leaders and their teams that can include everything from feelings of frustration and disempowerment, to surprise and elation. 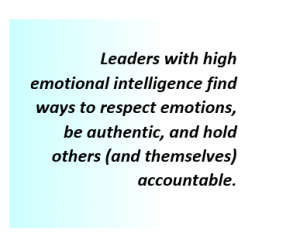 Leaders across organizational types are coming to understand that working in an emotion-filled context requires a special set of skills, and have recognized the importance of Emotional Intelligence (EI) for leading people. And, since colleges and universities are primarily people focused organizations, academic leaders can benefit from having an understanding of their own EI and how to use it within their leadership roles. 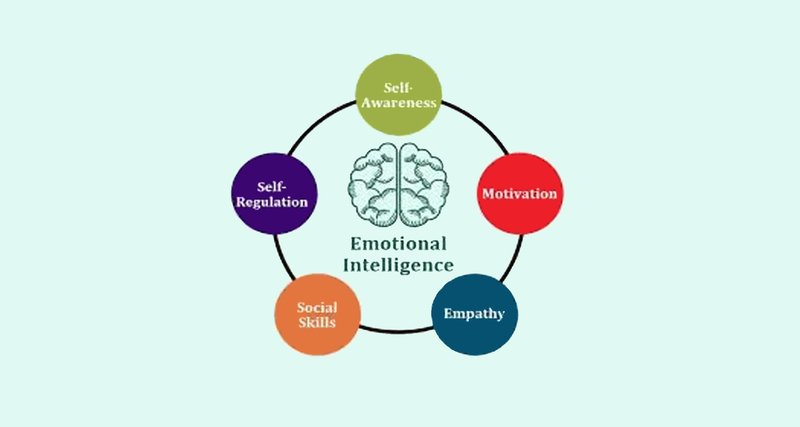 EI is the ability to actively regulate your emotions and the emotions of those around you through self-awareness, self-regulation, motivation, empathy, and social skills. Through our educational preparation, most academics are typically taught to downplay emotions so that they do not interfere with research or teaching. However, being disconnected or unaware of our own emotions and the emotions of others can be problematic when moving into a leadership role and having to work regularly with others on administrative tasks. (There is also increasing recognition that emotional intelligence has a role in teaching and research as well). The most effective leaders are all alike in one crucial way: they all have a high degree of what has come to be known as emotional intelligence. It’s not that IQ and technical skills are irrelevant. They do matter, but…they are the entry-level requirements for executive positions. My research, along with other recent studies, clearly shows that emotional intelligence is the sine qua non of leadership. Without it, a person can have the best training in the world, an incisive, analytical mind, and an endless supply of smart ideas, but he [or she] still won’t make a great leader. Self-Awareness: The ability to understand and identify one’s own emotions, moods and motivations and their effect on others. This may include when working with a contentious campus committee and understanding how one’s mood or raw emotions may impact the work of the group, either positively or negatively. Self-Regulation: The capacity to not let emotions become controlling of one’s actions; including the ability to put off judging or acting before carefully considering the situation. For, example one might be wanting to advance a new program for consideration at a department meeting. Rather than responding to an irking comment from a colleague, one would put those emotions in check and instead stay focused on actions and comments that advance the overall goal one is pursuing. Internal Motivation: Possessing a passion for one’s work based on internal curiosity, a larger sense of purpose, or joy of the work. These are different from external motivations such as money and reputation. For example, many in academia are motivated by deep interest in supporting student learning and/or advancing the knowledge of one’s field of study. Empathy: Being able to understand the emotional responses and feelings of others and using that understanding to engage with others in a way that is in line with their emotional state. Empathy can be important in a wide range of settings from an advisor working with a student to a department chair dealing with a disgruntled faculty member. Seeking to empathize with the other person can ease the relationship, reduce potential personal conflict, and help from or strengthen a relationship. Social Skills: Building on the other aspects of EI, leaders can then improve their ability to find common ground and build rapport in order to manage personal and professional relationships and build social networks. Given that colleges are human relations intensive organizations, the success of academic leaders is often dependent on their ability to build coalitions, creating common visions, and lead large groups of people to embrace and effect change. Such efforts necessitate expert social skills. When leaders apply the principles of Emotional Intelligence in their daily leadership practices, a myriad of congruent studies on working environments and job satisfaction revealed that self-efficacy is heightened. Essentially, not only do people feel more valued, they feel a heightened sense of empowerment and confidence in their ability to accomplish tasks and achieve goals. Emotional Intelligence is more than simply being nice and ensuring people feel good. It is about creating an environment that respects each other’s emotions and allows for authentic dialogs about disagreement and issues of accountability. As Patterson, Grenny, McMillan, and Switzler explain in their book Crucial Conversations: Tools for Talking when Stakes are High: “The mistake that most of us make…is we believe that we have to choose between telling the truth and keeping a friend.” Leaders with high emotional intelligence find ways to respect emotions, be authentic, and hold others (and themselves) accountable. Emotional Intelligence is an essential component of the leadership tool box of all leaders in higher education. When leaders are able to understand the role of emotions in decision making and engagement, possibilities exist to foster a renewed vision of potential for themselves and to support their organization in moving to higher levels of success. Harvard Business Review (2015). On Emotional Intelligence. Harvard Business Review Press. Patterson, Grenny, McMillan & Switzer (2012). Crucial Conversations: Tools for Talking when Stakes are High. McGraw Hill Publishers. Wonderful, what a blog it is! This blog provides valuable data to us, keep it up.